Edited by slydog, 07 March 2010 - 03:59 PM. Look's Fantastic Rob, the car look's great too! 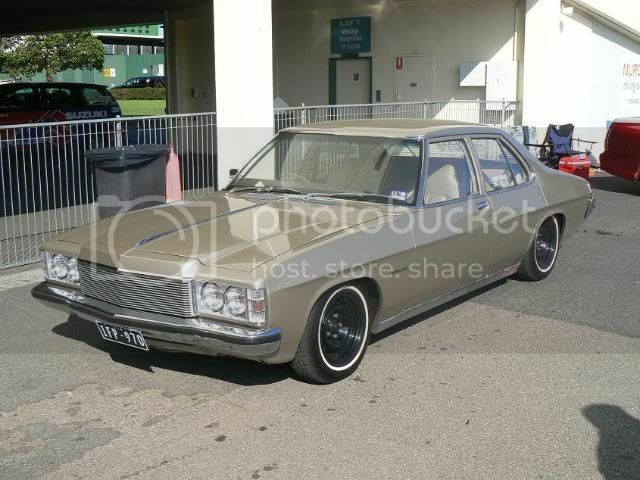 It's funny cos the car had $3000 worth of wheels on it and a drop tank and huge exhuast and no-one looked at it as much as they do now.Now with the widened stockies and tennis hat white walls and stuff everyone loves it? Yeah Brett it rocks! Me and the kids went for a cruise in it last weekend and my daughter just loves it! Although the Z needs to be lowered a bit more Rob. Whos car Glen,not one of Pyro's boys is it? Or we could put it on your XF ute,just don't know if it will match with the South Sydney colours you have going on it ATM...ha-ha-ha. Whos car Glenn, not one of Pyro's boys is it? No it's not Rob, it was my nieces b/f's car, I did the bodywork (vinyl roof off and delete strips and rear handles) and Shane (sas01) painted it for me. He must have cut the bump stops as wll because mine is on the stops in the back the front just bangs now and than.